January 17, 2019 – The 17th December 2018 marked The Royal Mint’s 50th Anniversary since leaving its historic site at Tower Hill, to move to Llantrisant in South Wales. By the 1960s The Royal Mint’s location in Tower Hill in London was cramped, poorly laid out and populated with old equipment, making it no longer a suitable location. 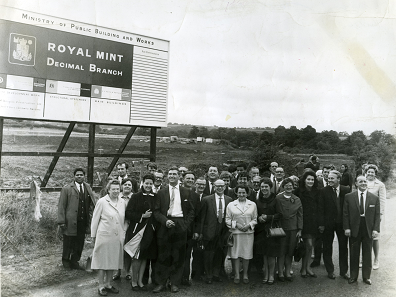 Construction of the new Royal Mint site in Llantrisant began in 1967. Photo: Royal Mint Museum. Plans to rebuild had been in mind. However, the announcement in 1966 that Britain would adopt a new decimal currency marked the beginning of the process to find a new location for the Mint. The demand for hundreds and millions of new coins needing to be produced led to more than 20 potential new sites to be considered by January 1967. 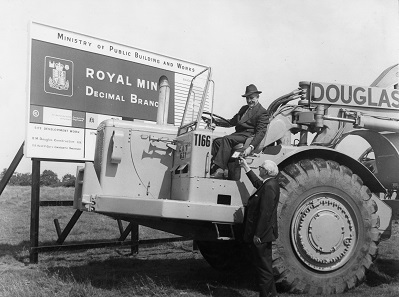 The first buildings of the Royal Mint site in Wales were opened in 1968. Photo: Royal Mint Museum. The list of potential new homes for The Royal Mint was soon shortlisted, and on that list was Llantrisant. A short distance just outside of Cardiff, Llantrisant had plenty of space to accommodate The Royal Mint and with the support of Cardiff MP James Callaghan, Chancellor of the Exchequer and Master of the Mint, Llantrisant was announced as the chosen site for The Royal Mint in April 1967. 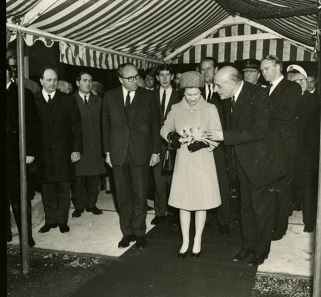 Queen Elizabeth, Prince Philipp, and Prince Charles attended the official opening in December of 1968. Photo: Royal Mint Museum. 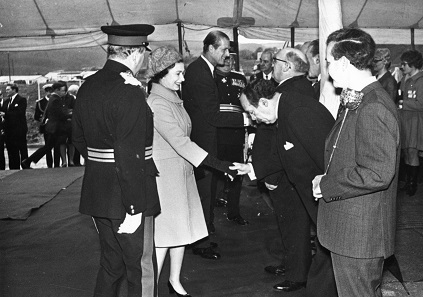 The Queen was welcomed at the opening by Royal Mint officials and employees. Photo: Royal Mint Museum. Fifty years since the move from Tower Hill to Llantrisant, The Royal Mint has continued to fulfil its primary duty of producing coins needed by the British public for everyday use. The business has also diversified into a number of other areas and today has a thriving commemorative coin and precious metals business, a newly launched Gifting business and a compelling visitor attraction in The Royal Mint Experience, all of which build on the values and knowledge that remain at the heart of the organisation. Anne Jessopp, Chief Executive of The Royal Mint said, “It’s wonderful to celebrate fifty years of The Royal Mint being in Wales and look back at how this unique organisation has grown and diversified over the years. Having the ability to adapt to changes in society is at the heart of what we do and it has never been more relevant as we look to reinterpret ourselves for the next 50 years. Exchequer Secretary to the Treasury, Robert Jenrick MP said; “Congratulations to The Royal Mint for 50 successful years in Wales. It is fitting that the world’s oldest Mint plays its part in our strong union here in the UK. More information on the history of The Royal Mint is available on the official website and the Royal Mint Museum’s 50th Anniversary microsite. A video clip of the opening of the new site in Wales in 1968 is available on YouTube.